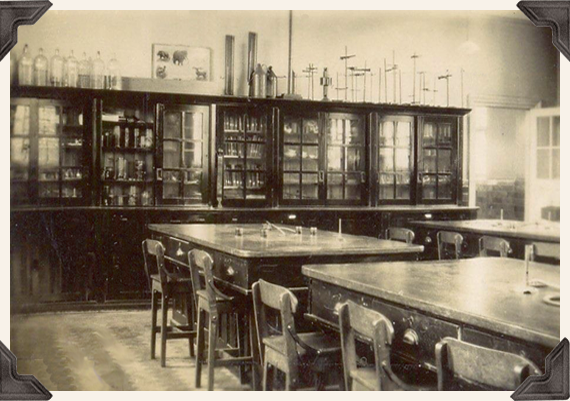 This is the biology lab I believe. When I was at the school in the 1960s it was the domain of Miss Starkey. It is now used by the Art Department. All of the benches have been removed... and the teacher's dais and demo bench. Shame really because it was a great room to teach in. As a small person I appreciated the raised position... you could see every girl, and what she was doing. And every girl could see what you were doing when you did a demo... The large benches were great for practical work too. Jo Chambers: It still looked exactly like that when I left the school in 1987! Clare Wassermann: Yes, those retort stands never moved! Liz Green: Looks very familiar. Katrina McNamara: Certainly looks like the biology lab! Irena Grugulis: And in the 1970s! April Goldsmith: couldn't quite get your knees under the desks though if I remember correctly! Vicky Ireson: That was my form room in the 90s! Ranna Patel: Miss Starkey was my Form Teacher when I was in 2J in 1972, I think someone lost the stick insects that year!